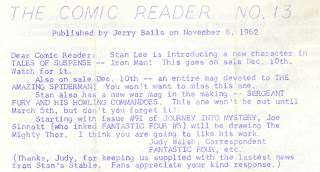 Kleefeld on Comics: Coming Soon: Iron Man, Spiderman, Sgt. Fury, Joe Sinnott! Coming Soon: Iron Man, Spiderman, Sgt. Fury, Joe Sinnott! Dear Comic Reader: Stan Lee is introducing a new character in TALES OF SUSPENSE -- Iron Man! This goes on sale Dec. 10th. Watch for it. Also on sale Dec. 10th -- an entire mag devoted to THE AMAZING SPIDERMAN! You won't want to miss this one. Stan also has a new war mag in the making -- SERGEANT FURY AND HIS HOWLING COMMANDOES. This one won't be out until March 5th, but don't you forget it! Starting with issue #91 of JOURNEY INTO MYSTERY, Joe Sinnott (who inked FANTASTIC FOUR #5) will be drawing The Mighty Thor. I think you are going to like his work. Slow Down Just A Minute There! Call For A Cover Artist!